Brooklyn District Attorney Eric Gonzalez today announced that prosecution of low-level marijuana offenses in Brooklyn plummeted by over 90% between January and June of 2018 as his Office expanded its policy of declining to prosecute simple possession cases to include cases of smoking in public. 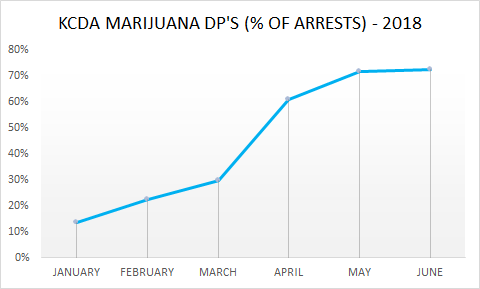 The declination rate has been rising steadily to over 70% of cases, correlating with a decline in arrests, which were cut by more than 60% over this time period. Given the success of the pilot expansion of the policy, the District Attorney announced that his Office will continue to decline to prosecute all but the most egregious examples of such offenses – when an individual is posing a threat to public safety. The District Attorney said that, starting in the spring of 2018, his Office gradually expanded its policy of not prosecuting low-level marijuana possession cases to include cases involving smoking in public, which are charged under the same statutes (PL 221.10 and 221.05). The only individuals currently prosecuted for these offenses are those who are posing a threat to public safety (e.g. driving with burning marijuana), are creating a genuine nuisance (e.g. smoking on public transportation or in a schoolyard where children are exposed to smoke) or are involved in violent criminal activity (i.e. “drivers of crime”). The new pilot policy started before the City announced its intent to ask the NYPD to begin issuing criminal summonses, instead of making arrests, in most low-level marijuana cases and before the NYPD outlined its revised enforcement policy that is set to take effect this fall. The success of the DA’s policy indicates that these enforcement changes can be made without jeopardizing public safety. The DA’s Office predicts that the number of prosecuted cases will be reduced further once the NYPD implements its new protocols. 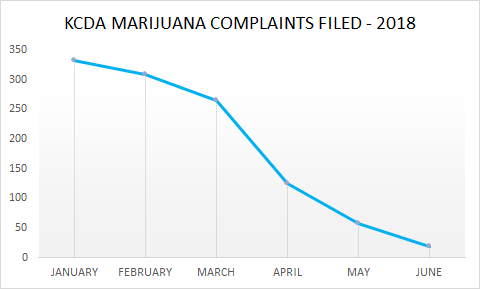 As the attached charts demonstrate, following an increase in cases that were declined prosecutions, the number of arrests has steadily decreased. Taken together, the number of cases that were accepted for prosecution this year declined from 349 in January to 29 in June – a drop of 91.6%. Of the cases that were prosecuted between January and June 2018, 84% resulted in a dismissal (by either an adjournment in contemplation of dismissal or by other means). In the remaining cases, the overwhelming majority were pleas to non-criminal charges, or violations (95.6%.) Only eight cases resulted in a misdemeanor conviction, and in all of those cases (0.37%) the defendants had prior criminal records. District Attorney Gonzalez said that as we move away from prosecuting these low-level offenses, we cannot forget those who have a conviction on their record based on conduct that we no longer prosecute. Having a marijuana conviction can seriously impede a person’s ability to get a job, education, housing and other important services. That is why the DA’s Office – as part of its Justice 2020 Initiative – is developing a new program for vacating and sealing marijuana possession convictions for thousands of people in Brooklyn. Details about this program will be released in the near future. Arrest numbers were reported by the NYPD while declined prosecution and complaint numbers were compiled by the DA’s Office. Accordingly, there are some variances in the data (for instance: an individual may be the subject to multiple arrests that get consolidated into a single complaint), making the proportion of arrests that were not processed for prosecution even higher.